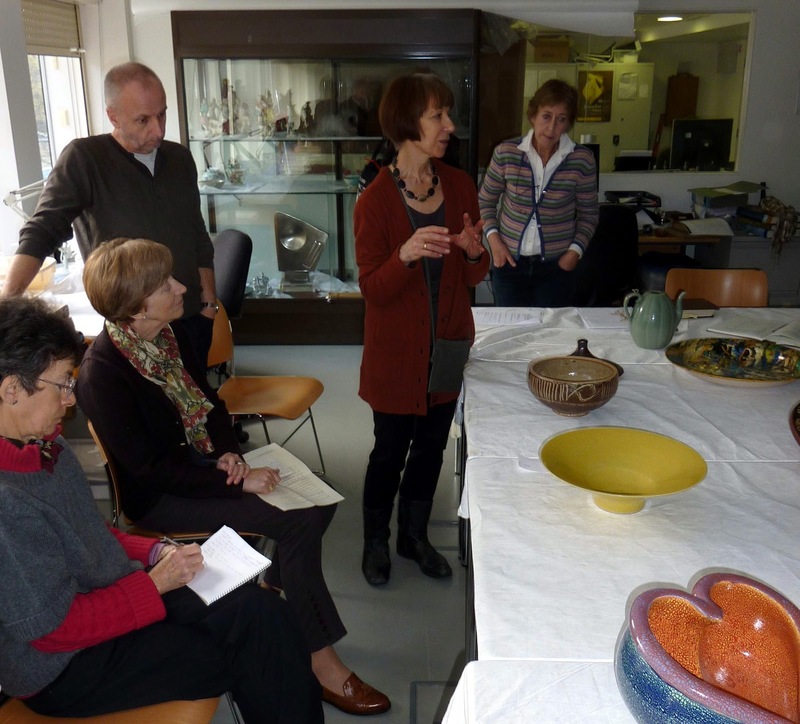 I took some Associate Members of the Craft Potters Association to the Fitzwilliam Museum in Cambridge on Tuesday, to view and handle seven ceramics from their collection. The Fitzwilliam has one of the best ceramics collections in Britain and doesn’t have room to display them all, so we were able to see some that aren’t on show. Above you can see Dr. Julia Poole, past keeper of applied arts, explaining one of the works to us. We were able to handle a celadon wine jug from Korea, a maiolica dish from the workshop of Durantino in Urbino, a very large Thomas Toft dish (left) with a picture of Adam and Eve, a Bernard Leach pagoda-lidded pot, a yellow bowl by Lucie Rie, a colourful pot by Kate Malone and a hollow, monochrome form by Gordon Baldwin. The pieces were chosen to cover a wide range of styles, methods and periods. 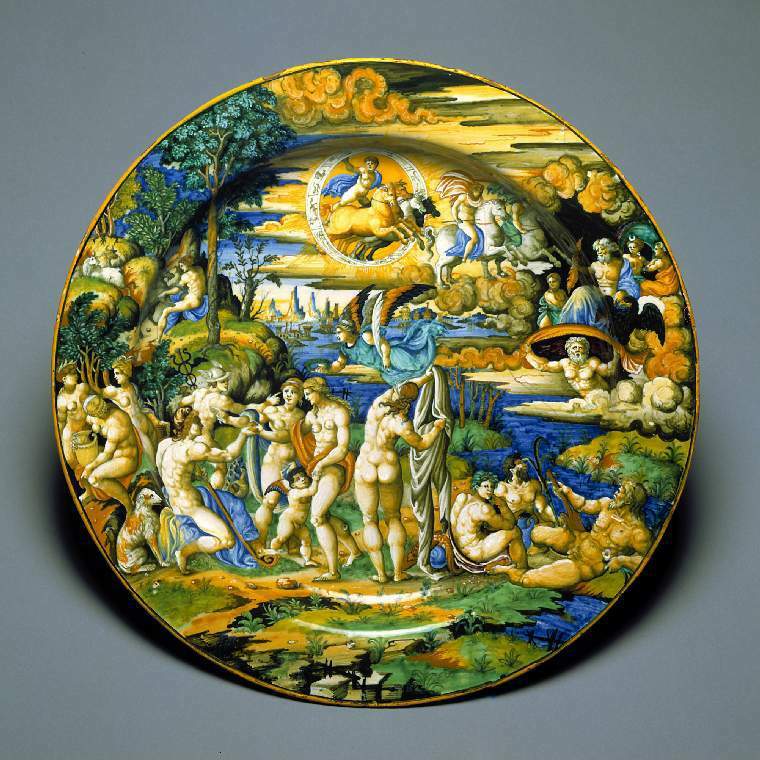 Dr. Poole is a specialist in Italian maiolica and gave a fascinating insight into the social conditions in which the Durantino dish was produced. The Toft dish was naively, even crudely, painted, but with great wit and energy and a skilled appreciation of how to fill a space with an image and decorative elements and how to create rhythm and energy with three colours. But the piece that stood out for me was the Lucy Rie bowl, in the centre of the table in the top picture. It is 34cm wide, finely made, with a pitted and bubbly, sulphur-yellow glaze. A Stoke-on-Trent potter would say that the glaze is faulty, but Rie, who made innovative use of pinholed, bubbling, and volcanic glazes, has judged it perfectly. It was made in the early 1950s. Perhaps it is unfair to compare it with the Leach dish, which was made towards the end of his life when his sight was failing, but it is so much more light and refined and lacking the peasanty affectation of Arts-and-Crafts pottery. I was familiar with reproductions of Manet’s Déjeuner sur l’herbe (above) long before I saw it in the Musée d’Orsay but however blasé I was the impact of its size (more than two metres by three) and the juxtaposition of the naked woman with the clothed men was great. 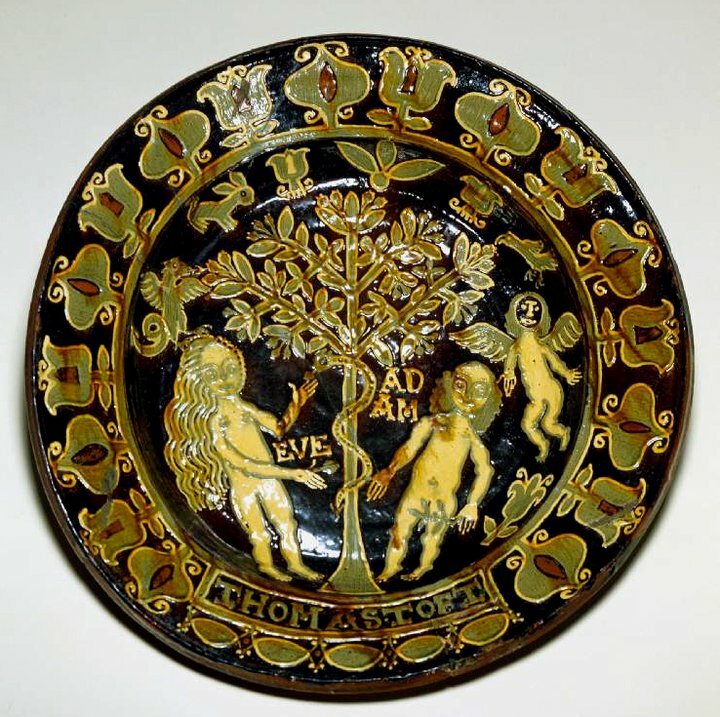 In the Fitzwilliam Museum in Cambridge, which has one of the best collections of tin glazed pottery in Europe, I saw a fine maiolica dish (left) from the workshop of Guido Durantino (16th century) showing The Judgement of Paris. 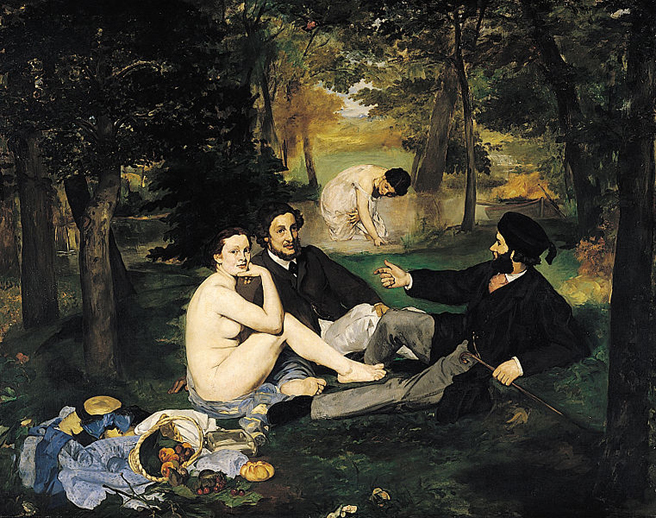 There, on the bottom right, was Déjeuner sur l’herbe though not so shocking as Manet because everyone is naked. 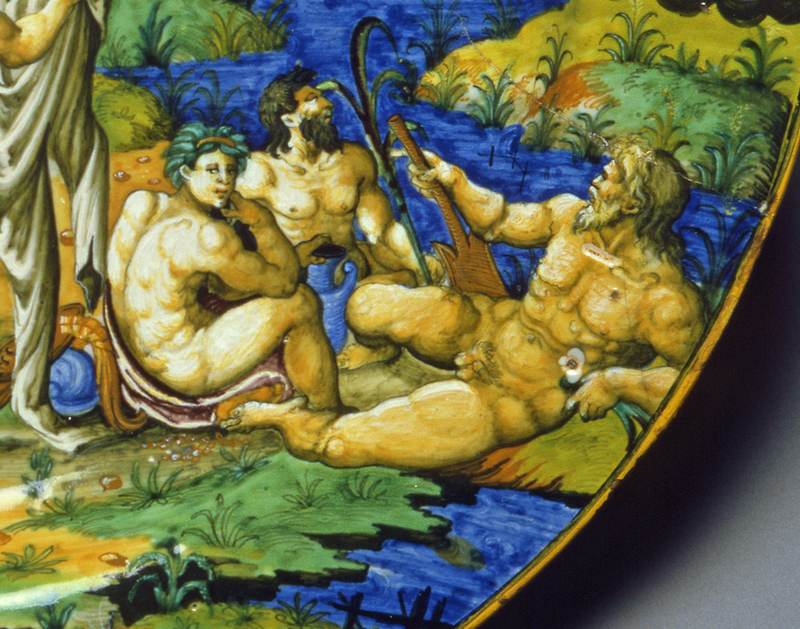 What’s the connection between Manet and a maiolica dish? Durantino copied a famous engraving by by Marcantonio Raimondi (below) from a design by Raphael. Manet studied the old masters and copied the three principal figures in Déjeuner from Raphael’s design.